Mayor Scott Galvin is pleased to announce the City of Woburn has been awarded $231,330 from the Green Communities Division of the Massachusetts Department of Energy Resources for more energy-saving improvements across the City. LED lighting for the Woburn Police Department, Woburn City Hall and the Joyce Middle School, and new EMS controls for heating and ventilation at the Woburn Senior Center. The grant also includes funding for the purchase of new electric vehicles and an electric vehicle charging station at the new Hurld Wyman Elementary School. Mayor Galvin applauded the state program for supporting what he believes is the responsibility of every community to pursue energy efficiency measures, large renewable energy projects, and innovative methods that use less fossil fuel. Mayor Galvin led efforts to earn designation as a “Green Community” several years ago. That designation has helped the City receive $1.5 million in grants from the DOER, funding a number of energy-efficiency projects (see below). 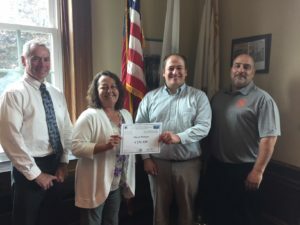 Mayor Galvin has worked with a range of City Departments, and for this round he extended special thanks to City Planner Dan Orr and DPW Assistant Superintendent Len Burnham, who worked hard to earn the highest dollar amount possible for Woburn. Mayor Galvin also expressed his thanks to the Green Communities Division (GCD) for providing grants, technical assistance, and local support to help Woburn reduce energy use and costs by implementing clean energy projects in our buildings, facilities, and schools. Other recent projects completed include a giant, 3.5-megawatt solar energy field that transformed an essentially unused landfill off of Merrimac Street into a reliable, clean energy source that will result in a solid revenue stream for the City.